A review of different saddle bags I’ve used over the years. The number of saddle bags I have bought in my cycling career is bordering on the faintly ridiculous. This is only a small selection I’ve tried and used. I really don’t know what I do to saddle bags, but they never seem to last. I think part of the problem with saddle bags is that no matter what size I get, I always end up stuffing more stuff than is sensible. My saddle bags end up bulging at the seems. In addition, I often try to fit them around Aero seat posts, which leads to straps getting frayed. Perhaps that is where I’m going wrong. People often seem to get attracted to buy ‘small’ compact saddle bags because they look good. But, when I get small saddle bags, I tend to regret it because I can’t fit in what I need to. Or you can fit everything in, but you need to spend ages stuffing it in and then having to take everything out to get at something. I’m also not keen with having weight in my jersey pockets, I’d rather have everything in a saddle bag and leave the jersey pockets for food only. It’s also good if you buy one with just velcro straps, so you can easily switch between bikes. Waterproofing is an issue worth considering, especially on a winter training bike. I’ve had problems with water getting into saddle bags and then later finding tools have started to rust. 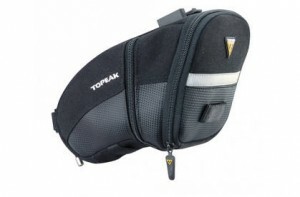 A waterproof saddle bag is a big boon. If you don’t have waterproof, make sure you remember to take out and dry all the stuff after a rainy day. Anyway these are some of the saddle bags on the market that I have used. I’ve had two Altura saddle bags like this. This was one of the saddle bags where I eventually had to throw away because the straps came loose. I did often change between bikes and used to stretch it around aero seat post. I’ve looked at recent Altura saddle bags and they seem to be an improvement on this model I bought 3 years ago. You can get two inner tubes, tyre levers and maybe something else, but it is quite a squeeze. 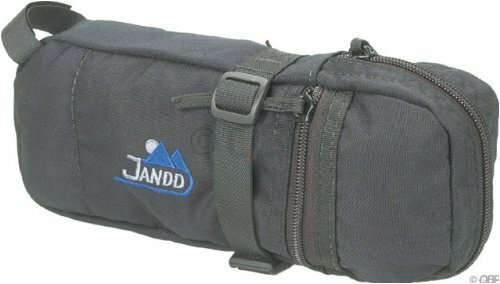 I bought this Jandd saddle bag in the US because I wanted a bag for my TT bike and for carrying a spare tubular. It is very long and thin – ideal if you want to carry a rolled up tubular and small mini pump. But, it is quite a niche product with not many people wanting this size and style. Many local timetriallists make do with attaching a tubular with straps and ties. It’s lasted relatively well – a few years now. It has no waterproofing properties, but it is easy and quick to put on and take off. This is useful for TT bike, as I don’t use when racing. The all round zip is good. This is quite aerodynamic and compact, but again quite a squeeze if you need to take quite a bit of stuff. Better than the Altura small saddle bag. It comes in sizes from XS to L. Sizes M and L have a built in function for carrying pump, which is pretty useful. It uses a quick release mechanism so you can attach it under your saddle. This is stronger and more rigid than relying on velcro straps, but it is harder to switch between bikes. Overall good design and the different sizes give you chance to choose most convenient one. I’ve had one for several years, but it is currently sitting unused because I prefer one that can be easily switched. I bought this recently, and is the best saddle bag I have had so far. The straps are easy to use and robustly built. It is easy to access the contents of the bag. The best feature is that the leather fabric on the underneath and rear give a degree of waterproofing – it helps keep the bag dry which is a boon for preventing a rusty multitool. Inside there are probably too many pockets, which are not worth using and would be better just having open space. However, the pocket underneath is good for keeping a multitool / tyre levers which makes it easier access than rummaging through whole bag. 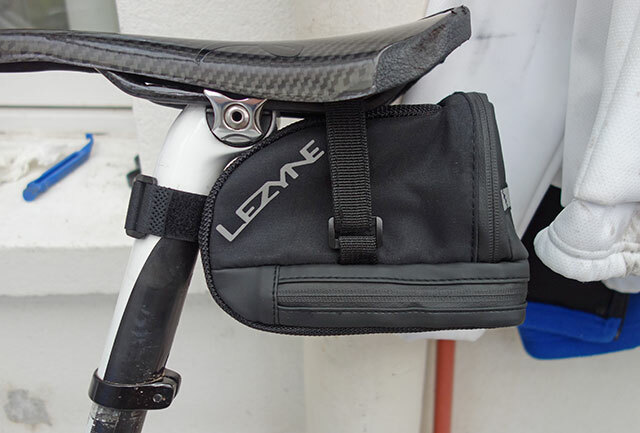 I did more indepth review of Lezyne L Caddy here: but a year later it is still going strong. At £21 it is a bit more expensive than others featured here. But, I think the extra £8 is worth it for the better quality and improved water repellent qualities. I bought a large saddle bag from Halfords for just £14. It is very roomy. You can easily take many tools and pump, but still have room for some clothing like a waterproof jacket. It is easy to attach and move between bikes. It just uses velcro straps around seat post and underneath saddle. The zip is easy to use and seems pretty robust. The only real challenge for this saddle bag, is to see how many years it will last. But, at £14 it is very good value and good design. It is completely non-waterproof – it is quite thin fabric. The other downside is that because it is so wide your legs can brush gently against the bag. This never was an issue for me, but I can imagine many would not like this. The other downside is that it is really quite unaerodynamic. There wouldn’t be much sense buying a super aero-road bike and then slapping this on. I use for my winter training bike, where I want to carry good waterproof. I notice Halfords have stopped selling now. This. This is the most important thing to realize about saddle bags /seat packs. 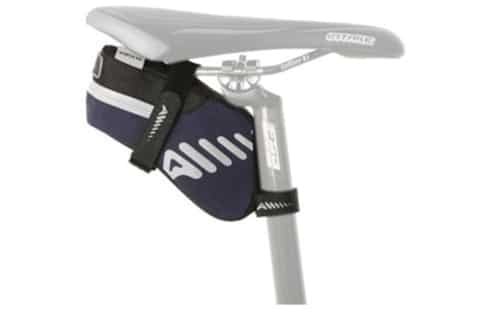 It took me a couple of seat packs, with those silly brackets that attach to the bottom of your saddle, to realize this.